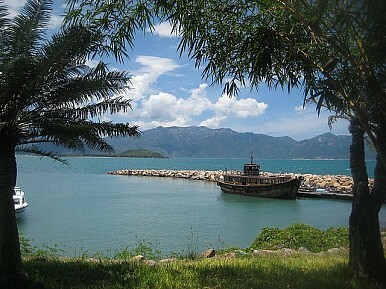 By announcing its Cam Ranh Bay plans at the ASEAN meeting, Hanoi moved the agenda past the Diaoyu Islands spat. The latest meeting of the 10-block Association of Southeast Asian Nations (ASEAN) again degenerated into little more than an overrated talk fest— if even that—with the blame this time being laid squarely at the feet of two ASEAN dialogue partners. China, whose reputation for bullying is now world-class, and Japan, where diplomatic stagnation is comparable with economic reform, hogged most of the attention at a genuinely lackluster meet of government ministers at the East Asian Summit in Hanoi—by deciding not to chat. The latest spat over the Diaoyu Islands and the way the Chinese ditched arranged meetings over its bit to reclaim a long abandoned playground was an international embarrassment and rated with Beijing’s performance at the Copenhagen Climate Change Summit last December. The islands fall well within the framework of the 1960 US-Japan treaty of Mutual Cooperation and were not contested for more than half a century after World War II while Beijing was still receiving soft loans as part of post-war reparations out of Tokyo. It left most observers a little flat. However, restoring some measurement of sensibility to the talks were the Vietnamese. Hanoi scored itself a minor diplomatic coup with its announcement that it will open up naval fleet services at the deep water port of Cam Ranh Bay to all the world’s navies. The Chinese will probably object to that too as it will enable the Americans, Russians and pretty much anyone with a tugboat or a submarine in need of repairs access to Southeast Asia through the South China Seas and its disputed waterways. Russia has already committed to building repair facilities as part of a $2.2 billion deal to provide six Kilo submarines for the Vietnamese. The base was Cold War booty, captured from the Americans at the close of the Vietnam War and later leased to the Russians, effectively until 2002. Since then, the Vietnamese have insisted that not one foreign power would be allowed to control Cam Ranh Bay and the decision was, thankfully, very much in line with the rhetoric. Just the very idea that American ships will find a safe harbor in the port of a former enemy should put the Chinese and Japanese on notice.